World champions Germany have won the FIFA 2017 Confederations Cup, a first half Lars Stindl goal enough to hand them a 1-0 victory over Chile in the final at St. Petersburg Stadium. Stindl scored his third goal of the tournament on 20 minutes when Timo Werner squared for him to slot into an open net with goalkeeper Claudio Bravo already committed. In the end, that was the difference between the Germans and a spirited Chile side, who found huge support among the Russian fans. For the final match, the ‘Tournament of Champions’ returned to where it began, St. Petersburg Stadium, which had already provided the stage for Russia’s 2-0 opening day victory over New Zealand on June 17. Back then the entire ground were cheering for Russia’s red, but for the final, the support in the crowd was certainly for the red of Chile, ‘La Roja’ having become a cult favorite among locals for their garish outfits and vocal support. During the closing ceremony before the game, gratitude was expressed towards each national team and the Confed Cup volunteers in the form of banners displaying a ‘Thank You’ message in the six different languages of the eight participating nations. Previous tournament winners were honored and there was even authentic music from the participating countries, including a Mexican mariachi band. When the game kicked off, Charles Aranguiz went close for Chile but he was denied by Antonio Ruediger with a perfectly timed tackle in the area. Arturo Vidal then banged the rebound against Marc-Andre Ter Stegen in the Germany goal. 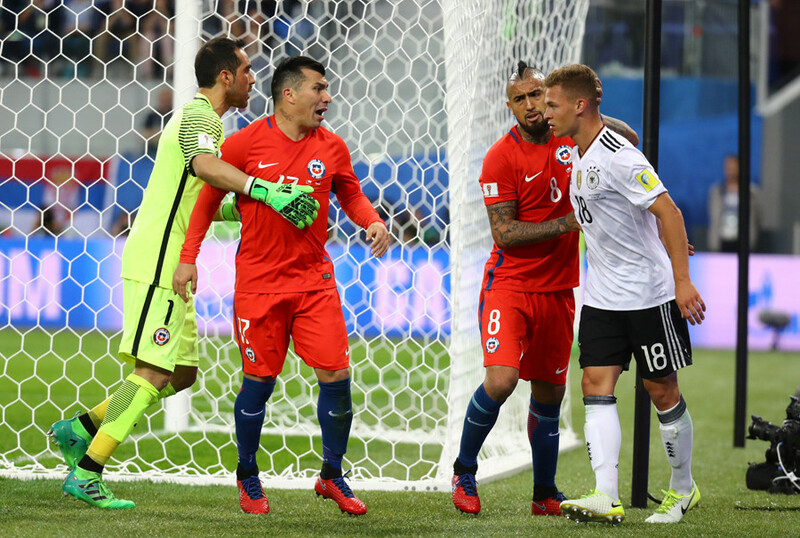 It turned out to be a costly mistake when moments later Timo Werner took advantage of indecision in the Chile defense to steal the ball and draw Claudio Bravo off his line. With the Chile keeper fully committed, Werner was able to square to Stindl to calmly place the ball into the open net with 20 minutes played. The goal came entirely against the run of play and drew a few deflated looks from the pro-Chile crowd, and was enough to make sure Germany went into the break leading the game. The second half brought incidents of controversy, again involving the Video Assistant Referee (VAR) system. When Gonzalo Jara appeared to elbow Werner on the jaw, Serbian referee Milorad Mazic jogged off the pitch to consult VAR. After a few minutes, Mazic eventually returned to the field of play and showed Jara only a yellow, rather than the red many had expected. VAR reared its head again when Alexis Sanchez went down in the German penalty area. Mazic seemed to allow play to continue so Vidal could shoot, but his effort was tipped over the bar by Ter Stegen. The referee again stopped play to review the incident, although no penalty was given. Tempers began to fray when Joshua Kimmich squared up to Bayern Munich teammate Vidal, both players eventually being booked. Then when Emre Can fell on top of the ball he was hounded by Chile players who grabbed and shunted him to release it. Can was booked for his troubles. Chile continued to press in the game’s final stages, and when Angelo Sagal blazed the ball over with the goal gaping on 83 minutes it seemed to sum up Chile’s luck in front of goal. The final chance for Chile came in the form of a powerful Alexis Sanchez free kick, which was pounded away by Ter Stegen. Five minutes of added time were not enough for Chile to rescue anything from the final and Germany won their first ever Confederations Cup. German goalkeeper Marc-Andre Ter Stegen was named man of the final, and German captain Julian Draxler the overall player of the tournament. Chile ‘keeper Claudio Bravo won the golden glove, while the golden boot went to German striker Timo Werner for his three goals and two assists. 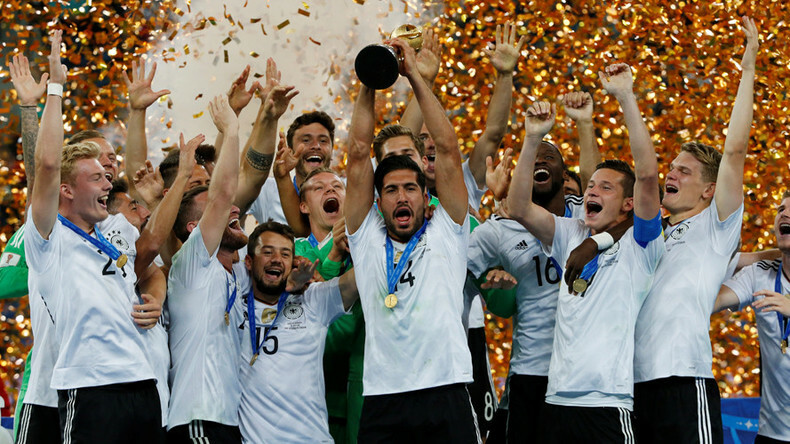 The victory means that Germany now hold the World Cup, Confederations Cup and European U21 Championship titles.